Highlighting our Channel Vacuum Bags — Sealer Sales, Inc.
Our February product of the month is our channel vacuum bags. Our channel vacuum bags are specifically designed for out of chamber vacuum machines. Using vacuum bags can extend the shelf life and flavor of your food as well as prevent freezer burn and dehydration loss. Since then, Boss Mouse Cheese has added a famous smoked butter (Rachel Ray loves it!) all packaged in Sealer Sales' channel vacuum bags. Thank you Boss Mouse Cheese for your unwavering loyalty. 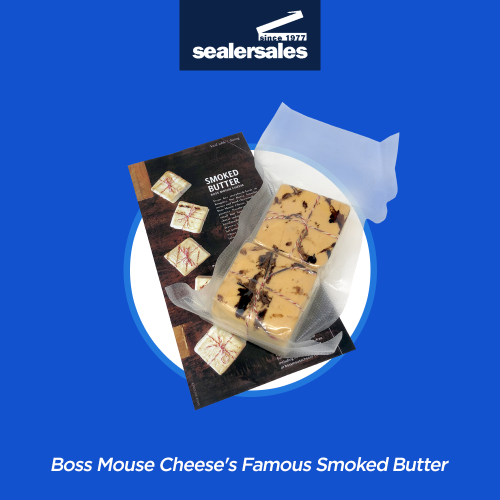 If you would like to try Boss Mouse Cheese, visit their website here: http://bossmousecheese.com/ You might regret trying the smoked butter...it's quite addicting! Don't forget that these vacuum bags must be used on a out of chamber vacuum sealer in order for the full benefits of food preservation and dehydration loss to take place. Visit our site for channel type vacuum sealers.